Posted on October 9, 2018 by Carole Mahoney	in Achiever Magazine, News and tagged Current Students, Education & Teaching, Faculty, News, Prospective Students. Editor’s note: This article, written by Global Media Center contributor Gil Klein, is featured in the Spring 2018 edition of “Achiever,” the magazine of University of Maryland University College. Instead of just telling the students what they needed to know, she assembled several Number 10 cans in which they would plant different kinds of wheat. As it grew, they would measure it for math class, they would talk about the history of the wheat in history class, and they would incorporate art in creating posters to demonstrate what they had found for biology projects. At the end of the year, that tiny class had won state-wide competitions, beating out the big city and suburban schools. 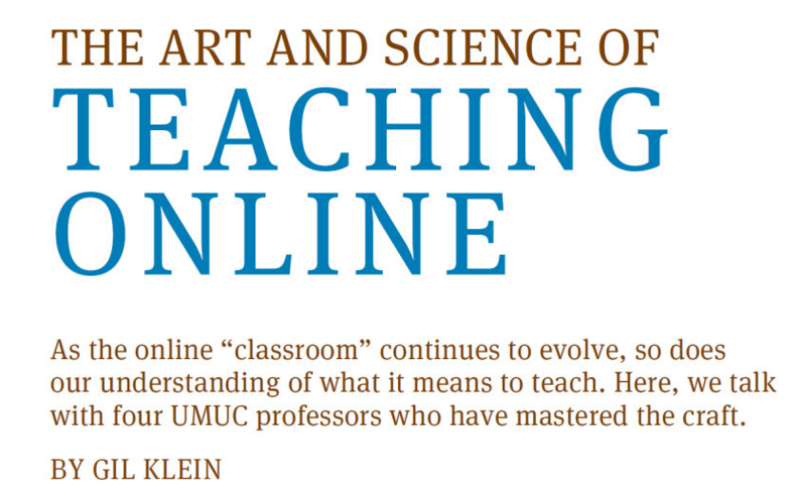 Now in his second decade teaching in UMUC’s communications department, Bishop is applying Mrs. Frazier’s teaching techniques to keep his students engaged online and his classes relevant well into the 21st century. He doesn’t lecture them on the principles of public relations. Instead, he has created a mock public relations firm called Parabolic Communications with its own website and leadership team. At the beginning of the semester, every student in his graduate class in Public Relations Techniques gets a letter congratulating him or her on being hired as a junior associate assigned to one of Parabolic’s clients, which Bishop picks from a list of 100 actual nonprofit organizations. That client becomes the student’s focus for the rest of the class. Bishop designed the course so students can use information from one assignment to the next. By the end of the term, students have complete performance portfolios they can show a prospective employer. Bishop said he sees his job as taking students out of their comfort zones with theory and traditional academic approaches and pushing them to understand and master practical approaches that work in the real world. For Laura Drake Witz, teaching online is more art than science, and she is grateful for the opportunity it offers her to practice her craft from her home in Georgia, far from the bustle of the Washington metropolitan area. Her new hometown was so small that it didn’t even have cable television, and Drake Witz had to get a special satellite hookup so that she could continue to teach. That was 14 years ago. Now she is part of UMUC’s Executive Doctor of Management program, which offers students a pathway to a doctoral degree on a very demanding three-year timeline. An important component of a faculty member’s role is to serve as a guide, project manager, and even cheerleader for students who may be feeling overwhelmed. She was teaching data analytics, for example, when she happened on an article about IoT—the “Internet of Things”—and how monitors can now be placed in appliances, packaging, and more. The story mentioned how a sensor could be put in psychotropic medication to inform a doctor if the patient had taken the medication that day. While she might never have anticipated that discussion, Drake Witz said, it turned out to be an important part of the class because it opened students’ minds to new applications of data analytics, as well as their potential consequences. Another veteran faculty member, Jesse Varsalone, has taught for 20 years total, 10 of them online, and often draws on his experience in face-to-face classes for new strategies in the online environment. A full-time collegiate associate professor in the computer networks and cybersecurity program, Varsalone is known for his creativity in designing real-time, scenario-based computer lab experiments that help keep students current on strategies to combat ever-evolving cyber threats. He may be best known, though, for leading UMUC’s prize-winning competitive cybersecurity team, the Cyber Padawans. And he is currently a student himself, pursuing a Doctor of Management at UMUC. Those different pursuits add up to a broad perspective on what works in the online classroom. Those who are heard perform better, which is why, in this age of social media and constant connectivity, Varsalone emphasizes rapid responses to all student queries. “If students e-mail me, I try to get back to them in five minutes or less,” he said—even if that means just sending a message that says, “I am away from my desk; as soon as I get back, I will respond. Varsalone said he believes that project-based learning, where students are assigned real-world projects rather than research papers, is the future of online education—and UMUC is poised to be a leader. While some criticize online learning because faculty members cannot see firsthand which students are attentive, Varsalone said that online platforms offer access to analytics that may actually be better indicators of what students have studied and learned. As a tangential benefit, Varsalone pointed out that online teaching opens academia to a new type of teacher who may bring new and different skill sets to the online classroom. Teaching face-to-face, he said, you often have to be a storyteller, a people person comfortable performing in front of a class, and even an actor. That can scare off some highly qualified people. Online, most classes are asynchronous, so teachers need not respond in realtime and can think their responses through more carefully. Also, online instruction can open teaching roles to professionals with other jobs and responsibilities. Not all challenges have to be addressed in the online classroom, Varsalone said, recommending that students who lack the self-discipline or technical know-how to succeed in an online environment first take courses at a community college. James Bryant, who served as a U.S. Air Force logistics officer for 17 years, now teaches in UMUC’s acquisition and supply chain management program. He believes that textbooks are headed for obsolescence, and instead recommends leveraging video game technology in the online classroom—something the U.S. military has been experimenting with for some 20 years. But no matter how sophisticated technology becomes, he said, the faculty member will always play a critical role, serving as instructor, mentor, and guide. He encourages his students to participate in professional organizations—such as the National Contract Management Association (NCMA) and Project Management Professionals (PMP)—that can help enhance their skill sets while at the same time offering networking opportunities that can yield long-term professional benefits. And perhaps most importantly, he makes himself available online and by telephone so that when students have questions, someone is ready and willing to answer them.